Friends..On the eve of the 69th Independenence on 15th August 2015, Union Government has announced the winners of Rajiv Gandhi Khel Ratna Award and Arjuna Awards 2015. Rajiv Gandhi Khel Ratna 2015 was awarded to Sania Mirza. Arjuna Award winners and their discipline will be surely an expected questions for all upcoming exams. Here are the details of Arjuna Award 2015. * Arjuna Awards are given by the Ministry of Youth Affairs and Sports, government of India to recognize outstanding achievement in National sports. Instituted in 1961, the award carries a cash prize of Rs.500,000, a bronze statuette of Arjuna and a scroll. 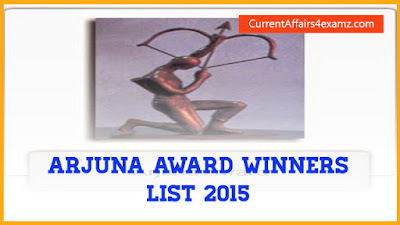 * Arjuna Award is given for consistently outstanding performance for four years preceding the year of award. * A large number of nominations were received for these awards this year, which were considered by the Selection Committee headed by Mr. Justice V.K. Bali, former Chief Justice of Kerla High Court and consisting of eminent sportspersons and sports administrators. * The awardees will receive their awards from the President of India at a specially organized function at the Rashtrapati Bhawan on August 29, 2015. * Arjuna Awardees will receive statuettes, certificates and award money of Rs.5 lakh each.